Indian Prime Minister Narendra Modi has said India "proved its power" to the world when it launched "surgical strikes" on militant bases in Pakistan. 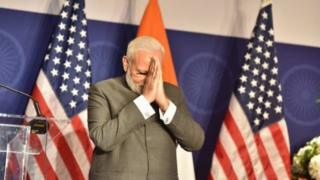 Mr Modi, in the US on an official visit, told a gathering of Indian-Americans in Virginia that the incident showed India "practised restraint but can show power when needed". The Indian leader earlier met the heads of 20 US companies, including Apple's Tim Cook and Google's Sundar Pichai. He meets Mr Trump later on Monday. India's claim of "surgical strikes" along disputed Kashmir's de facto border last September was dismissed by Pakistan. The term usually applies to a precise assault using air power or troops on a particular area. But a subsequent BBC investigation found that despite the use of the term "surgical strikes", India did not airdrop commandos to hit militants inside Pakistani-held territory, or conduct ground assaults deep into the Pakistan-administered side. They did, however, cross the Line of Control dividing Indian and Pakistan-administered Kashmir, in some cases by more than a kilometre, to hit nearby Pakistani border posts. Mr Modi's invitation-only Virginia event at the Ritz Carlton was very different from his 2014 Madison Square Garden event, when he addressed 19,000 cheering members of the Indian diaspora. Can Modi and Trump recreate Obama magic? Discussing his government's policy on terror, Mr Modi said: "When India talked of terrorism 20 years back, many in the world said it was a law and order problem and didn't understand it. Now terrorists have explained terrorism to them so we don't have to." Mr Modi's speech could be an attempt to strike a chord with the tough-talking Mr Trump ahead of the first face-to-face meeting between the two leaders, correspondents say. During his meeting with business leaders, Mr Modi also raised India's "business friendly" climate. After the meeting he tweeted: "Interacted with top CEOs. We held extensive discussions on opportunities in India."